The 2016 Coachella lineup dropped in January with news that not one but two iconic bands – LCD Soundsystem and Guns N’ Roses – will reunite for the celebrated festival. You’ve already seen the sun-soaked imagery – the stunning backstage backdrops, the glorious sunsets, the intense after dark pleasure-seeking. But what makes Coachella tick? ANDREW MURFETT looks back on its 16 years. Photos by KATIE FAIRSERVICE. THE three-hour drive from Los Angeles feels akin to a travelling circus. Having congregated together the previous night in LA (mostly in hotel bars in and around West Hollywood, Silverlake and Downtown) after flights from disparate cities around the world, tens of thousands of us set out at various junctures on the Interstate 10 freeway, heading east towards Palm Springs. The proximity of Coachella to LAX allows you to hook a US trip around it. You can begin your American adventure by flying into LAX two days prior to opening day and take in the three-to-four hour drive to the site, which is unremarkable until the desert landscape emerges a couple of hours in. There’s a buoyant sense of shared anticipation as the factory outlet malls give way to mountains and clusters of wind turbines. There’s no doubt the growth of the Coachella Valley Music and Arts festival has coincided with the ascent of its closest major city Palm Springs as a hipster retreat. And a trip to Coachella is more than merely watching bands on a lush field in the Southern Californian desert. It incorporates the exhilarating ritual of embarking on an overseas trip with friends, absorbing the outside ambience of the Coachella grounds, assimilating to the site and then experiencing a shared sense of temporary community with tens of thousands of random like-minded fans. One afternoon – on the bus that ferried us from the hotel to the site – our entire group (comprised mostly of strangers) broke into a spontaneous, exuberant hum-along of Duck Sauce’s Barbra Streisand. COACHELLA’s accessibility from LA, the spectacular desert geography and the diverse lineup – this year’s headliners include LCD Soundsystem, Guns N’ Roses, and Calvin Harris – are why it endures as a preeminent music festival destination. Even its staunchest critics readily admit that their ability to create a unique fan experience is almost unparalleled in the world of music festivals. Coachella mastermind Paul Tollett – who founded Coachella with his partners at Goldenvoice (back then a boutique, independent LA rock promoter) – has never been stingy in investing in staging, aesthetics and sound quality. Exploring the site, you will come across elaborate and expansive art installations, many inspired and designed by prominent LA artists and architects. So impressed was a critic by the eye-catching structure behind the main stage at Coachella in 2011, he decried that the building of the stage was in fact the show itself. Then there’s the legendary Ferris which wheel provides majestic desert views at dusk and is the best spot to drink in the site and absorb its size and scale. The bar to the left of the main stage provides some of the best people (celebrity) watching outside of West Hollywood’s famed Soho House. In one two-hour drinking session we saw Breaking Bad’s Aaron Paul, Vanessa Hudgens, Paris Hilton and Kelly Osbourne. Leonardo DiCaprio famously danced incognito (or so he thought) to MGMT in 2014, while Danny DeVito’s live tweets were a social media highlight of 2013. Speak to musicians, managers, music insiders and punters who regularly make the pilgrimage and a consensus emerges. Coachella has accomplished something exceptional: an event esteemed and respected by artists and musicians at all levels that has mostly retained its cultural cache without alienating the bulk of its constituency. The festival unofficially opens the Northern Hemisphere summer season and serves as a preview of the next few months of live music around the world. Coachella’s recent growth has been irrepressible. In 2012, organisers doubled its capacity (currently at 96,000 per day), by replicating the same three-day festival lineup in the same order over two consecutive weekends. Critics were dubious, yet each year since all 200,000 three-day passes have sold out with staggering velocity. Last year’s GA passes sold in record time: 40 minutes. In fact most Coachella passes sell via an online presale held seven months before the lineup is even announced. In 1999, Coachella’s first year of operation, organisers wore a loss of $800,000. The event’s founders innovated by marketing its spectacular location alongside its music. Last year, they raked in $78 million purely from ticket sales. The event’s footprint now extends well outside Palm Springs city limits. A Coachella-themed cruise toured the Caribbean in 2012, branded clothing lines sell at H&M and partner festivals are sprouting up right across the US. 1999 was a strange period for music and festivals alike. The detestable Creed and Limp Bizkit were the dominant commercial rock acts. And Coachella’s initial lineup announcement took place the week a much-hyped Woodstock reboot went awry. Fans at Woodstock rioted over food and drink prices and poor site conditions. The graphic scenes, replayed incessantly on US television news channels, appeared almost apocalyptic. The aftermath provoked an examination of the overall viability of US music festivals. Regardless, Coachella debuted in October 1999 as a 40 band, two-day event led by Rage Against The Machine, Morrissey, Beck and Tool. Frente’s Angie Hart made an appearance and as Rolling Stone noted in its review, the festival felt electronic music’s heavy footprint – Chemical Brothers, Juan Atkins, Roni Size, Derrick May, Kool Keith and Underworld all played. Tickets were $50. Capacity was just 35,000, a number that in hindsight sounds positively minimalist. A Forbes article from the late ‘90s noted organisers targeted “high-minded fans of college radio and dance music, not more down-market types.” The strategy helped establish Coachella’s artistic legacy and nurtured a demographic willing to spend to enjoy its festival experience. The only act to previously play the Coachella site at Empire Polo Club was Pearl Jam in 1993. Reports described the event as a nightmare of traffic snarls and parking issues. The vision for Coachella was unambiguous: a multi-stage, weekend-long festival with a vibrant Southern Californian setting. Paul Tollett worked the gig and recalled its immense grass field bordered by palm trees, mountains and horse stables. He aimed to cultivate a weekend of interesting, diverse music in a spectacular setting. Festivals, he said, were a gruelling experience. 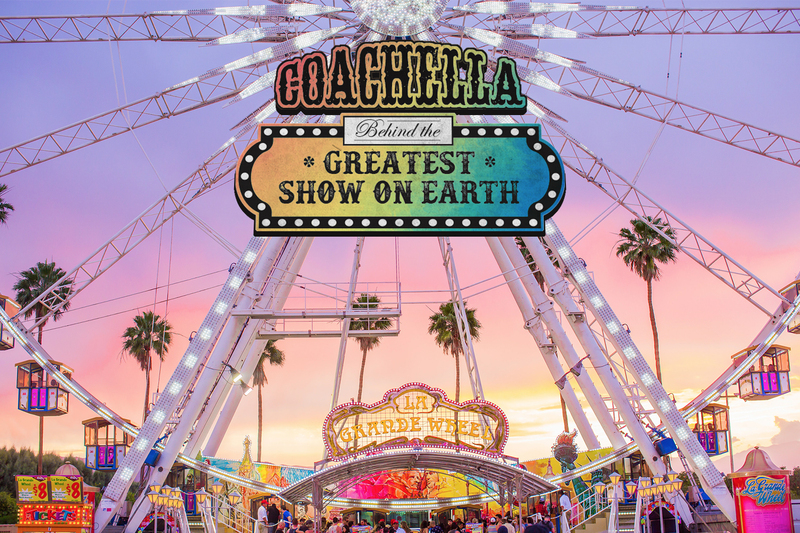 Coachella sought to be a space to lure cynical fans back, renew their enthusiasm for the festival experience as a place to have fun, discover new music and luxuriate in hip heritage acts. It was a bold gambit. At the time, The LA Times called it “The Great Experiment in the Desert.” John Watson, manager of silverchair, Gotye and Missy Higgins among others says at the time, destination-based festival culture was almost non-existent in the US. “These things always look more inevitable in hindsight than at the time,” Watson says. “For various reasons back then the big US shows mainly tended to be touring entities. In the ’90s you had Lollapalooza, Warped and Ozfest travelling right across the US over summer. 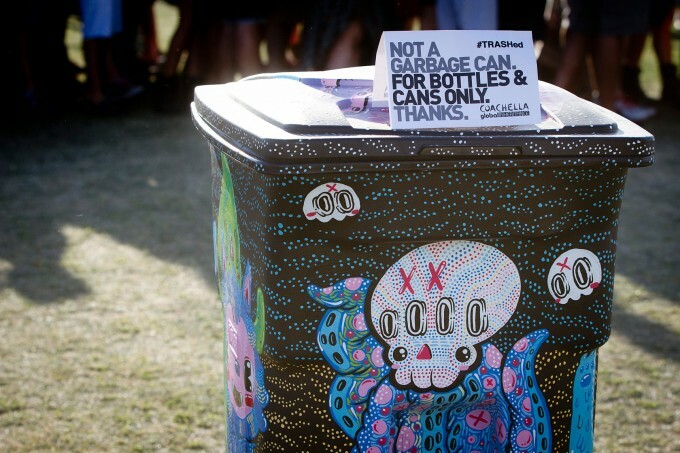 Smaller freestanding shows like Coachella were the exception rather than the rule.” In the end, Watson notes, Coachella’s unique positioning facilitated its longevity. “It was that ‘specialness’ that made them carve strong niches for themselves and thus allowed them to endure,” he says. Although a creative success in 1999, Coachella was unprofitable. Still, even in its first iteration, it attracted fans from around the world – one in ten ticket buyers hailed from outside California. Coachella eventually returned 18 months later as a single-day event with a new April timeslot and a Jane’s Addiction reunion as well as Weezer, Fat Boy Slim, Sigur Rós and The Roots. THE 2002 lineup sits as a superb time capsule – Oasis, the Strokes, Prodigy, Björk, Foo Fighters, the Vines, Queens of the Stone Age and Jack Johnson mixed with Paul Oakenfold, Groove Armada, Jurassic 5, the Beta Band and Dilated People. It was also Coachella’s first event to turn a profit. That same year a Tennessee-based competitor called Bonnaroo was established along with a Texas upstart, Austin City Limits. Two years later Lollapalooza set up permanent camp in Chicago, rather than juggling multiple sites around the country. 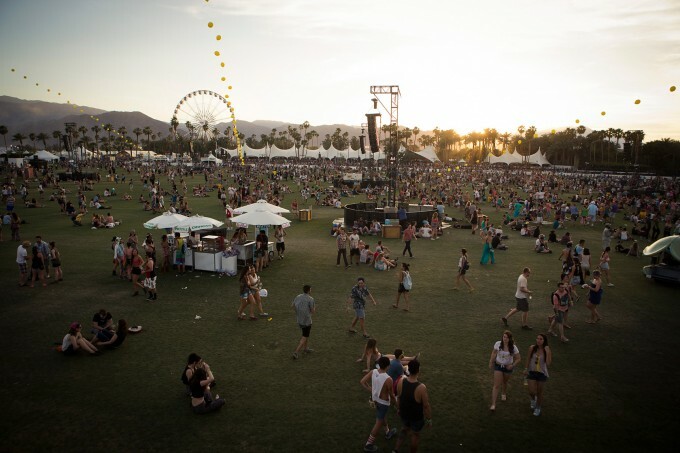 The pioneering success of Coachella was helping foment the now booming US music festival market. In 2003, Coachella reunited Iggy Pop with Ron and Scott Asheton, the two brothers he started the Stooges with in 1967. Also on the bill: the White Stripes, Red Hot Chili Peppers, Beastie Boys, Sonic Youth and Blur. “One of the festival’s most admirable aspects is that it manages to be a relatively successful mass-audience event by focusing on a band’s quality rather than its draw, a band’s credibility rather than its accessibility,” wrote the author Neil Strauss of that year’s event. During 2004, Goldenvoice partnered with another promoter for Field Day, a two-day New York festival that taught them an expensive lesson about Coachella’s unique charms. Field Day was a sales catastrophe and organisers were forced to move the event to a stadium in New Jersey amid a huge rain deluge. Just 15,000 tickets were sold. That same year Coachella had itself ironically risen to the next-level, hosting a reunion from seminal rockers the Pixies. News of that reunion, coming 11 years after their break up, ricocheted around the music world and was a huge moment for Tollett, who booked the band’s LA debut in 1988 as a 22-year-old promoter. Festival capacity ascended to 50,000 per day and the online buzz as Radiohead, Kraftwerk, the Cure and Danger Mouse joined the Pixies was deafening. 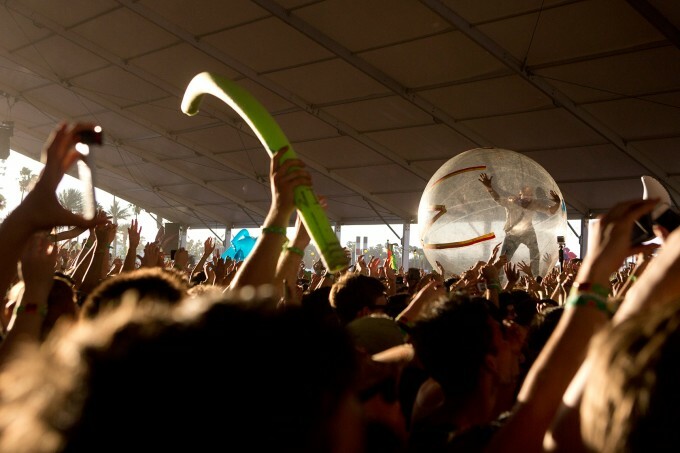 Coachella had arrived as one of music’s biggest aspirational events. And the buzz only intensified when Madonna, Depeche Mode, Daft Punk, the Yeah Yeah Yeahs and Gnarls Barkley anchored Coachella 2006. 2007’s event centered on Rage Against the Machine’s now legendary reunion show and Coachella stretched to three days for the first time as tickets rose in face value to $250. In 2008, Prince powered through an epic set, Rogers Waters of Pink Floyd, the Verve, Justice, the Breeders and Portishead headed the lineup. This would be the final Coachella not deemed a sold-out event. FOR more than a decade, one of Coachella’s defining imprints is the release of the now-iconic poster heralding the bands selected to play. It is judiciously curated each year with a mix of artists anchored around EDM and indie-pop and typically augmented by a supersize veteran act. Every January the unveiling is a massive digital event and quickly becomes the most scrutinized rock poster in the world. The poster is now an intrinsic part of the Coachella mystique. In the months leading up to the event it’s not uncommon to see dozens of dream lineups posted online or counterfeit posters claiming to be the real thing. For a developing band, merely landing on the poster elevates their status in indie circles. For Australian acts, it provides concrete evidence of an improving profile. Among booking agents, there is goodwill for Coachella. While festival programmers are often difficult negotiators with vast egos and a tendency to demand an unreasonable amount, insider scuttlebutt is reasonably positive. While headline acts customarily earn seven figures plus – Prince earned a cool $2 million for his 2008 slot and Morrissey was offered $5 million to reform the Smiths – lower rung acts don’t expect a huge payday. The true value of their slot is exposure. Of the agents we spoke to, all intimated that the organisers appear to genuinely care about attempting to curate a musically memorable experience. IT’S something of an understatement to suggest that Coachella has hosted some remarkable musical moments. Rage Against the Machine’s volatile return after seven years apart in 2007 is arguably top of the list. Then there was the moment in 2012 that Dr Dre and Snoop reunited on stage with a Tupac hologram for an extraordinary medley of hits. In 2014, Outkast chose it to unveil their reunion, itself seven years in the making. Previous years saw the raw, scattered Amy Winehouse performance following her infamous joust with a cluster of Australian journalists and the time Robert Smith of the Cure defiantly played on for 30 minutes sans microphones after organisers cut his sound after curfew. Vampire Weekend, Wolfmother, Lorde, Jay-Z, the Black Keys, Cut Copy, Kanye West, Coldplay, M.I.A., Kings of Leon, Arcade Fire and MGMT, to name a few, have enjoyed huge breakout moments. The fact is any artist under the age of 30 who grew up a music fan most likely put Coachella on their bucket list and would tend to view it through the prism of a fan. CALL it the haves and have-nots. As is the case in the US generally, Coachella is not egalitarian. In fact there is a dizzying number of elaborate packages with a bewildering number of price points and status levels once you make it on site. The latest – and perhaps most extreme step away from its roots – is the option of a three-day pass augmented by a four-course sit-down meal from a buzz-worthy LA eatery. A VIP ticket with meal included sets you back $1,024. Ahem. Still, the Coachella onsite VIP package is truly bucket-list worthy. Comfortable on-site accommodation is provided by the festival, but the best perk has you whisked between stages on the same golf carts the artists. You are then allotted space to watch bands from the side of the stage. With this particular wristband, it’s possible to watch every band on your list without ever leaving the sanctuary of the backstage area. From a festival perspective, it’s as decedent as it gets. Meanwhile as Coachella has grown, so has the circus around it at each of the most area resorts and hotels. The two best hotels to splurge on for the festival remain The Ace and La Quinta resorts. Both are filled with bands and punters and feature excellent afterparty options for those in the know post-show. Both also offer frequent shuttles back and forth from the festival site. Entry is relatively straightforward. There is an entire group of people who travel to Palm Springs each year without Coachella tickets and stay at these resorts merely for the parties on offer. Unfortunately, spontaneity is not really an option. Sort yourself out in advance. COACHELLA itself is a venerated brand, an adjective or byword for successful, super-size music festivals. The growth of the franchise into unadulterated powerhouse has been gradual but pronounced. Although its origin story is charming, Goldenvoice – the company behind Coachella – is no longer a boutique indie outfit, having been bought out by AEG, the second-largest rock promoter in the US. In ensuing years the Goldenvoice and Coachella imprint has expanded significantly. 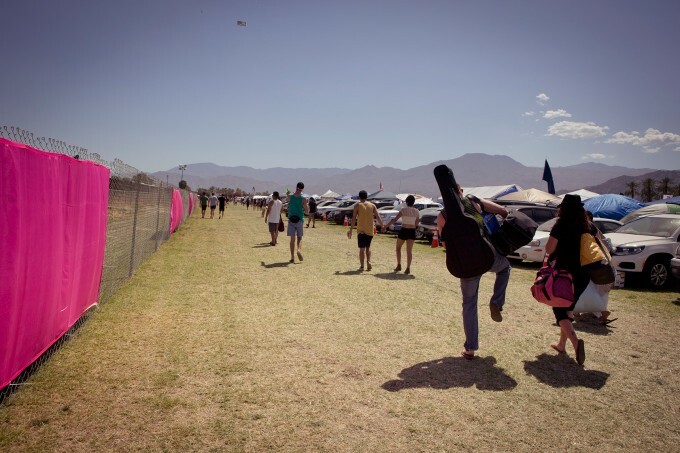 In 2007, Goldenvoice started Stagecoach, a three-day country music festival held on the same grounds as Coachella, that also regularly sells out. In 2012, there was the SS Coachella, two branded cruises that sailed from Fort Lauderdale to the Bahamas and Jamaica and featured acts approved by Coachella like Pulp and James Murphy. 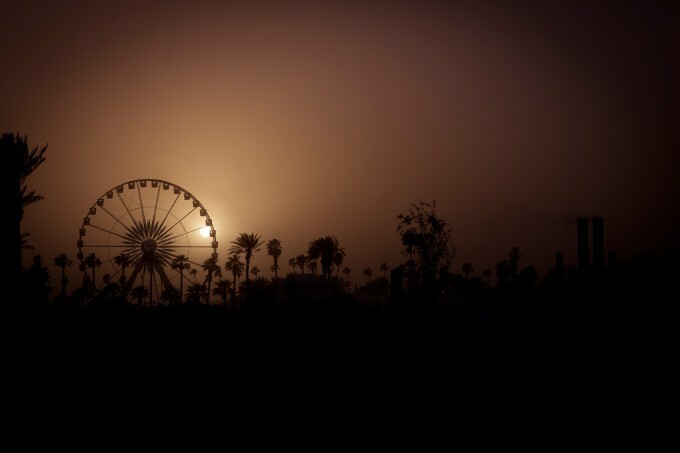 Also in 2012, the company purchased 280 acres of land surrounding the Coachella site. The following year, it signed a deal with the local council to keep the event at Empire Polo Fields through to 2030. It also allowed the group to expand from three high-capacity yearly events to five. Last year, they announced a new partnership with a festival in Alabama called Hangout Music Festival which the Foo Fighters will headline in May. It comes after a similar arrangement with a festival in Delaware called Firefly. This expansion came after the festival’s latest initiative, a venture with H&M to launch a Coachella-branded clothing line. THE combination of Coachella’s seemingly endless expansions and the remarkable announcement that AC/DC would headline last year’s event has critics wondering if Goldenvoice is testing its fan base too much. Prominent Los Angeles music writer Todd Martens recently voiced some common concerns from longtime devotees. “There’s no denying AC/DC’s stable of built-to-last hits, but the band’s brand of beer-and-pool music is one Coachella once seemed to rebel against, as the fest’s reputation was built on of-the-moment acts and cult stars,” he wrote. History suggests no matter how strong a festival seems, nothing should be taken for granted. One unavoidable problem, however is once you become “the establishment” it’s much easier for other smaller, newer events to seem cooler. Which, of course is what transpired in Australia between the on-hiatus Big Day Out and the St Jerome’s Laneway festival. It is difficult to sell hundreds of thousands of tickets each year and present the world’s biggest artists without turning something that is, by definition, mainstream. Coachella 2016 takes place at Palm Springs, California from April 15-17 and April 22-24, hosting the same lineup over two separate weekends, including LCD Soundsystem, Guns N’ Roses, Calvin Harris, Sufjan Stevens, Foals, underworld, Ice Cube, Disclosure, Chvrches, Sia, Flume and Rancid (plus heaps more). Check out Qantas flights to LA here or use the fare finder below.